Heat oil in large saucepan on medium heat. Add onions and celery; cook and stir three minutes. 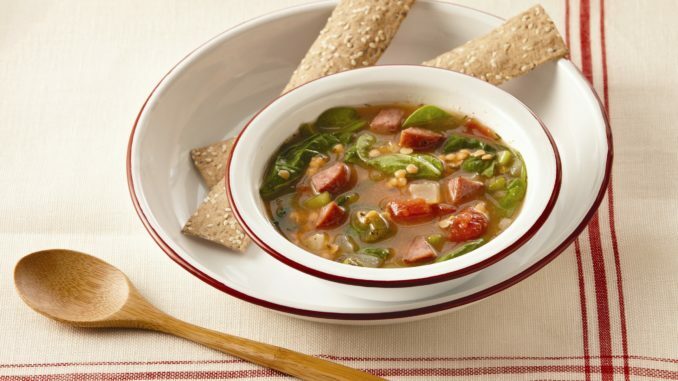 Add kielbasa; cook and stir three minutes longer or until kielbasa is lightly browned and vegetables are softened. Stir in thyme, garlic powder, paprika and red pepper; cook and stir two minutes or until fragrant. Stir in broth, tomatoes and lentils. Bring to boil. Reduce heat to low; cover and simmer 15 minutes or until lentils are tender. Stir in spinach. Simmer until wilted. Ladle into soup bowls to serve.